Batumi is one of the oldest cities in Georgia founded as early as BC. Its initial form – Batus – had already been mentioned in the 4th century BC. The name must have derived from the Greek word meaning ‘deep’. Aristotle (4th c BC) Pliny (2nd c AD) and others called the place “Pontus Bathea”. In antique times the local population used to have active trade relations with the neighboring as well as distant countries. During the reign of the Roman Emperor Hadrian (2nd c AD) there used to be a Roman military camp on the territory of present Batumi. 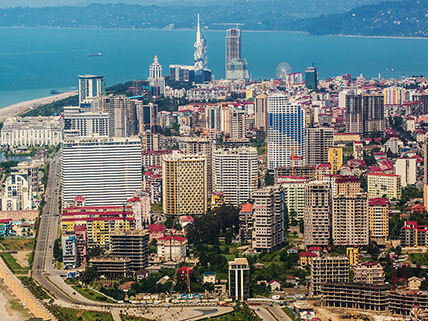 Batumi is distinguished by a seacoast humid subtropical climate. Winters are cold, without snow and summers are warm to hot. The average annual temperature is 15 C, 7 C in January and 23 C in August. Annual precipitation is 2.560 mm. Relative humidity is 81%. There are frequent showers. It rarely snows but melts very soon. The average annual water temperature is 17 C at the shore. Cool breezes blowing from the sea moderate the temperature in the summer. A small natural lake is located in Batumi in the 6 May Park. Various types of subtropical plants are spread throughout in Batumi and its vicinities. There are many cultivated parks, tea plantations and citrus plantations. Indigenous Colchis natural trees and shrubs have still been preserved in select areas around the region. Most Georgians do not use central heating so although the day temperature can be warm, bring warm clothes for sleeping at night.